I've decided to start a new series of posts on my blog, which are basically installments of a story which I made up myself. I hope you enjoy! His blood dripped onto the rock. The glittering crystals shone against the pale, black stone. Was this cave supposed to be a challenge? This was too easy. A spike impaled the wall behind him, and an arrow missed him by a mile. Turning a corner, he stopped. An unmistakable groaning sound was coming from down that hallway. Pulling out his sleek black pistol, he took aim at the bend. His torch felt like it was floating away from his hand as the lights went out. For the first time, he felt scared. "Get a grip on yourself," he said with difficulty, because his teeth were chattering gently. "The curse of Oblivion is a folk tale and not to be believed!" A tremendous roar filled the chamber, and as he turned. 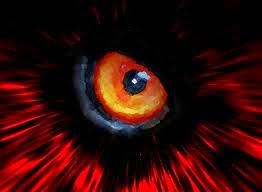 A pair of red eyes stared right back at him. He screamed and fired his pistol. Fear flooded through him. He watched as the bullet sailed through the air for a split second before turning and sprinting with all his might towards the way he came. A sharp pain came from his right thigh. He risked a glance down and looked at his leg. An arrow was sticking out of his thigh. The arrow launcher! Why hadn't he remembered that there was a trap here? Cursing, he continued running, but he kept stumbling through the traps, until finally, the ravenous beast caught up with him, and death claimed his soul. It just wasn't right. It just wasn't. All this mist in the middle of July. And the hurricane that had killed all those people and destroyed all those houses. And the murders of all those people. And the plane that disappeared in broad daylight, claiming the lives of hundreds of innocent people. Something was really wrong. Looking out the window, he heaved a sigh. His parents were dead. His brother was dead. He looked at the silver knife that lay upon the kitchen table. He walked out of the lonely sitting room. He looked out at the door at the withered grass around his feet. He felt a surge of anger, and kicked the fence. The wooden planks that were once sturdy fell to the ground with a thump. He tried to calm himself. He took a deep breath. He looked at the once busy, now silent city. He walked back into the house and picked up his bag. Inside were food rations, a few full water bottles, some spare clothes, a torch, and a first-aid kit. He looked at the silver knife on the table. He thought about it for a minute, and picked up the knife and slipped it into his belt, which contained his father's black pistol, his home-made binoculars, and strange purse that his father had left him in his will, before his father vanished into the cave. He heard a rustling sound behind him. Without thinking, he threw the knife. It whistled through the air before carving itself through the masked man's throat, before returning to his hand. He looked at the knife in his hand. He couldn't believe what he had just done. He had just killed someone. But this man was probably going to kill him anyway. But how was he awake? Turning to the masked man he looked at what he had. He had a baseball bat in his hand, and a pistol in the other. Pocketing the pistol, he glanced at the bat. It seemed like there was something strange about it. He picked it up as well, took another look at it, and threw it over the fence, into the valley. It flew like a boomerang back to him. He glared at the bat. He threw it again. This time, it looked like it had vanished. He smiled and turned only to feel the bat hit the back of his back. He wasn't smiling then. He got up and looked down the road. The street where there would be hundreds of cars speeding through it was now silent. He walked through the street without looking, and opened the purse. Inside were more things that an ordinary purse could hold. There was a map, a pair of mechanical boots, made out of, what was that, titanium? He put on the boots. He looked inside again. He took out the helmet with a visor. It was just his size. But why would he need it? He looked at the map. The cave was on there, marked with an X. He wondered why. He turned towards the cave. He pulled out the silver knife. He then realized he had a bloody nose. Instead of tending to it, he had the feeling that letting it drop down onto the rocks would be better. Suddenly, the moss covering the cave dissipated leading to a polished purple door. He could barely hide his shock. He tried to open the door, but it wouldn't budge. He took the knife and stuck it into the lock. The door flew open. His mouth fell open. Crystals littered the ground and the walls. He stepped through, and stepped past sharp crystals. Suddenly, an arrow hit the wall to his left. He realized he had snagged a tripwire. Frowning, he picked up the arrow and put it in the purse. He went from room to room. There was one room where he had to use a bow and arrow to hit a button. There was another where he had to battle a robotic garden gnome. Then, finally, he got into a long corridor. His senses went on the alert, there was a strange feel about this place. He saw two gleaming red lights. But they were moving. Then he realized that they were eyes. And they were getting bigger, and bigger, and bigger. He pressed a button on the helmet instinctively, and suddenly, he could see in the dark. He looked at the massive demon. He held a black crystal blade and he had blood-red skin. He had two massive horns sticking out of his forehead just above the ears. He felt a funny feeling, like he should be feeling something else. He then realized that he should be terrified, but he wasn't. He realized he couldn't fight this beast. It was too strong. He opened his mother's handbag, and, hoping that there would be something of use in there; he was not disappointed. He took out the golden amulet with seven different crystals engraved into it. "I must be mad," he thought as he walked towards the beast, and held out the amulet. The beast, instead of growling and charging, took the amulet from the boy and handed him the sword. The beast then disappeared into thin air. There was a portal, glowing a pale baby blue. He looked at his new sword. There was a name engraved into the hilt. This is not usually the genre that I enjoy reading, but you got me hooked from the start! With your words, you painted a very vivid picture of how the story unfolds. I am so looking forward to the next installment! Joshua. I have really enjoyed reading your first instalment, as a reader I was hooked. A great opening! The sub-headings help me understand that the second paragraph is a different character. I like how the father and son connection. Your vocabulary choices are excellent and you are very good at painting a picture and describing how the characters are feeling. One thing that confused me slightly is the distance between the city and the cave. The son seemed to arrive at the cave very quickly. Also, you mention the mother, having crystals and the Dad in the first paragraph not believing in superstitions. I think you could possibly expand on this contrasting relationship. I am looking forward to your second instalment and finding out what happens next. Particularly since the beast has given your character the sword and that a portal, perhaps to another land or another time, has appeared!